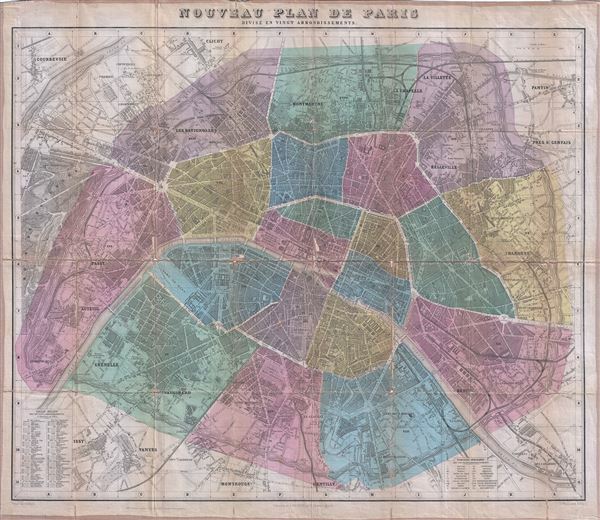 This is a beautiful 1899 folding map or plan of Paris, France by the French cartographer A. Vuillemin. Centered on the Seine River, it covers embastilled Paris as contained in the Thiers Wall, as well as its immediate vicinity, including part of the Bois de Boulogne. It reflects the transformation and modernization of Paris under Napoleon III and Georges-Eugene Haussmann. Divided according to 20 Arrondisments, the map notes individual streets, monuments, churches, town halls, railways, gardens and palaces. Important and historic buildings are shown in profile. This map was drawn by A. Vuillemin and engraved by E. George. Average. Original linen backing exhibits wear and some splits. Overall toning. Some wear along fold lines, including parts of map chipped off. Accompanied by 46 page street index booklet and original binder.